The Philadelphia® Tracheotomy Collar has been an industry standard for decades. Now, Össur, the manufacturers of the Miami J and Miami J Advanced, is proud to unveil Philadelphia Adjustable. Constructed from the same high-quality materials as the original, Philly Adjustable combines convenient size adjustability with immobilization and comfort. Fit 95% of patients with a single SKU. Anterior height adjustability covers sizes 2, 3 and 4 of the original Philadelphia Tracheotomy Collar. Tear-off tabs accommodate neck circumferences from 10 to 19 inches. Restricts cervical spine flexion, extension and rotation comparably to the original Philly collar. Adjustable bilateral fasteners ensure proper fit. Total cervical arch support maintains neutral alignment of the c-spine. Two-piece design enhances patient comfort. 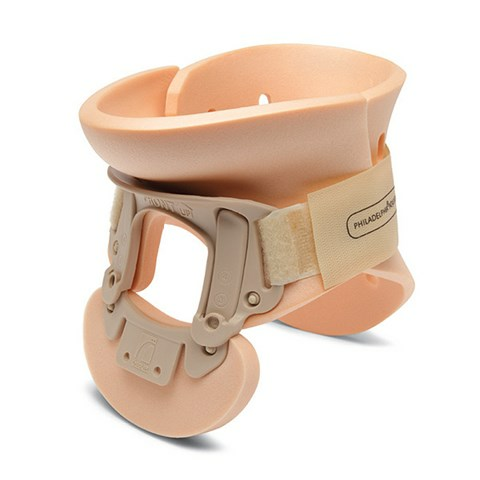 Conforms to shoulder and mandible contours for stability and comfort. Ventilation openings reduce heat and moisture. Latex-free, non-toxic and hypoallergenic Plastazote® foam helps reduce skin irritation. Water-resistant for bathing and aqua-therapy. NOTE: The table above represents common sizing only. Sizing must be verified by the healthcare provider for each patient individually.